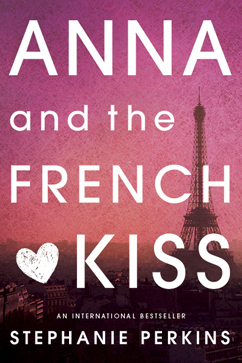 At the beginning of April I listened to Anna and the French Kiss by Stephanie Perkins on audiobook. Spring was *allegedly* in the air. Despite it taking a few more weeks for spring to officially bustle its way into Brooklyn, everyone kept talking about spring as if it was actually around and not still as cold as it had been in March. Thus, with everyone buzzing about spring, I decided to try to embrace a springtime attitude by delving into some fun, light reads. Light, fun reads typically don’t require me to think too deeply about what’s covered in the book beyond the scope of the characters and the storyline within the novel. I need books like this to balance the nonfiction and sociology texts that I usually bury my head into during the fall and winter months, when I can’t quite get into the fun books that I mentally associate with spring and summer (whether or not the books are actually set in spring or summer). I started going down my To-Be-Read list on GoodReads in alphabetical order and checked out the first book that I felt fit into my mentally assigned fun and light category that was also digitally available from my library. This is how I came to listen to Anna and the French Kiss. The book follows Anna, a spoiled and sometimes annoying protagonist, who is switched from her high school in America to a boarding school in Paris, France. The plot sounds like that of a high schooler’s daydream and the entire book reads that way, but there’s nothing wrong with that! However, I did find the main character a bit grating at times when she didn’t realize how lucky she was to have the opportunity to attend an elite boarding school with all expenses paid and when she frequently complained about minor issues in her life, while the main male character (and eventual love interest) dealt with his very ill mother and tumultuous relationship with his father. Characters like Anna seem to be very common in YA “chicklit” territory which is typically overrun with protagonists who complain about little things — but what typical American teenager (me included) isn’t constantly addled by small complaints and a refusal to see the big picture? Thankfully, toward the end of the book, the narrator comes to realize how frivolous some of her worries detailed throughout the novel were, which ultimately made the book more enjoyable for me. This book definitely satisfied my itch for a springtime read and while I didn’t love the book as a whole, I could definitely see myself reading the rest of the books in this series (though it’s not so much a series in the traditional sense because the books follow different characters) by Stephanie Perkins in the future. Do you have any great spring/summertime reads to recommend? I would love to add them to my TBR list for the coming months! Publication Date: 2 December 2010 by Dutton Juvenile. Format: Digital Audiobook from Listening Library. This entry was posted in audiobook, fiction, Review, young adult and tagged anna and the french kiss, audiobook, book, book review, chicklit, dutton juvenile, fiction, kim mai guest, listening library, reading, stephanie perkins, summer read, young adult, young adult fiction on May 7, 2015 by Bri with a book blog. This book is amazing!!! I loved it too much!